Getting young adults excited about voting, like getting them excited about anything, is much easier when music’s involved. 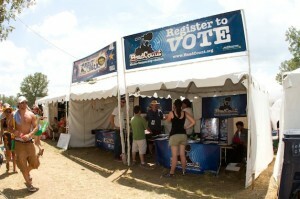 HeadCount, a nonpartisan grassroots organization that uses the power of music to register voters and raise political consciousness, knew this when they launched the HeadCount Participation Party in 2004. The HeadCount Participation Party has registered more than 200,000 voters to date, but it takes more than a voter card to get people out of the house on election day. That’s why they took to the road three election seasons ago with a tour designed to get people excited about casting their vote. This year’s tour will make four stops along the East Coast leading up to the U.S. presidential election in November, and will be headlined by two artists who took very different paths to eventually call the same city – New Orleans – home: Anders Osborne and Dumpstaphunk. Dumpstaphunk, on the other hand, draw their inspiration from ‘70s inner-city funk. They have been called “the best funk band from New Orleans right now” by the New York Times and will undoubtedly have the entire crowd dancing for democracy by the end of the night. The tour will also include surprise guests as it hits Baltimore (11/2), Philadelphia (11/3), Washington (11/4), and New York (11/5). Tickets are now available here. To learn more about HeadCount, whose board members include Bob Weir of the Grateful Dead and Marc Brownstein of Disco Biscuits, visit its website. You can also find out about volunteering at one of the 1,000 concerts they support every year, including The Shins and Wilco. Read our interview with HeadCount’s executive director, Andy Bernstein, here.